The Altai Mountains, considered by some the “Green Pharmacy” of the earth and the “lungs” of the planet, is one of the cleanest and most unpolluted regions in Russia. 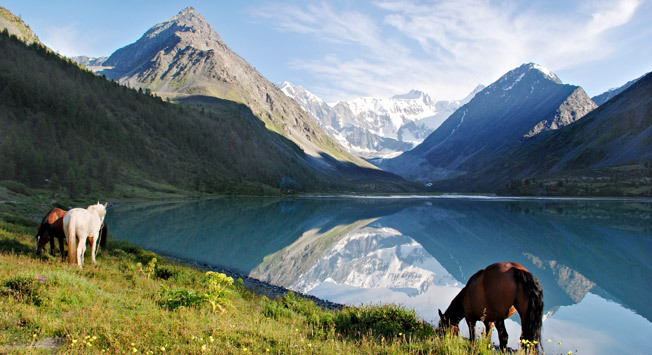 As a result of its remote location, Altai’s nature has been well preserved. Nature reserves comprise 20 percent of the Altai Republic territory, and 126 natural monuments are also located in the area. Mountain lakes here remain crystal clear, while forests, dotted valleys and mountain slopes make the air truly salubrious. Thanks to the careful protection of nature in Altai, rare medicinal plants still grow in the area. Before leaving for your trip, you should know where to go. The largest part of the Altai mountain range crosses the territories of the Atlai Republic and Altai Krai -- administrative subjects of Russia that are often confused with one another. The locals are not fond of this confusion, therefore it is worth it to make a minimum effort to remember that Gorno-Altaisk is the capital and only city in the Altai Republic, located just south, while Barnaul is the capital of Altai Krai, where the closest airport is located -- you most likely will arrive there if you decide to travel to Altai by plane. There is no transportation by rail, so getting to this hill country is possible only by plane or by car -- from Barnaul to the mountains you must travel by bus. In general, the center of the Altai Republic, Gorno- Altaisk, is the transit point to the Altai Mountains. The Altai Republic is located at the heart of the center of the Eurasian continent. Though it is far from the largest administrative unit of Russia, its size is comparable to Portugal, Jordan, and Hungary. Roughly 200,000 people live in the area, and are mostly ethnic Russians and Altai people. Altai people are considered ancestors of modern Turkic peoples, including Tatars, Yakuts, Uzbeks, Azerbaijanis -- Mesopotamian Sumerians used expressions and words found in the Altai language as early as 3000 B.C. Altai, as one of the few places in the world in which a unique type of oral folklore endures, is a place of storytelling. Storytellers, known in Altai as kaichi, perform their work through throat singing, with accompanying music on the tapshure, a two-stringed musical instrument. Kaichi sing both folk songs and heroic epics -- known as kai. Do not miss the chance to listen to kaichi, as they are very impressive. The longest kaichi performance can last several days. The Katun River is one of the most famous and relatively accessible attractions of the Altai Republic. Many legends about the Katun exist among the local people -- almost all of them include the daughter of Khan Altai, who seeks her beloved Biya (Biya is yet another Altai river) -- and so as the Katun River turns, along with the Biya River it merges into the Ob, Siberia’s largest waterway. The easiest way to begin a journey is from the village of Manzherok, which is located near the lake of the same name, as well as directly on the shores of the Katun. The chain of tourists facilities begin here, at which you can rent equipment and kits for motor-rafting and rafting. Prices are fairly reasonable -- a boat excursion to the famous Kamyshlinsky waterfall costs around 500 rubles or less. The season for rafting starts in May and ends in October. The first tourist to Altai was the Russian artist and philosopher Nicholas Roerich -- he arrived in Altai in 1926. In the village of Verkhny Uimon (which in Altai means ten wisdoms), the house of local resident Bartholomew Atamanov, where Nicholas Roerich organized his headquarters, is now home to a museum for the artist. Bartholomew Atamanov was repressed during the Soviet era and his estate was recovered as a museum only in the 1990s. When travelling through the Altai Mountains, it is impossible not to drive on highway M-52, which is also known as the Chuysky Trakt. M-52, 541 km long, extends across the Altai Mountains to the Mongolian border. Construction on the highway began in the second half of the nineteenth century and was finished in the mid-twentieth century. It is one of the most picturesque highways in Russia, and perhaps the world. Chuysky Trakt leads to Kalbak-Tash (in Altai, flat rock), the site on the right bank of the River Chu full of runic inscriptions. Thousands of petroglyphs belonging to the Scythians, Huns and ancient Turks are preserved here. The petroglyphs of Kalbak-Tash make a strong impression, and they are public -- viewing them and taking photos are absolutely free. In his diaries, Nicholas Roerich wrote that during the Great Migrations, Altai played a key role as a transition point for a variety of nomadic peoples on the continent. In prehistoric and likewise historic times, according to Roerich, Altai was like an “unopened treasure.” The Pazyryk Burials are one part of this treasure trove, with its Scythian tombs for tribal chiefs that date from the 5th to 2nd centuries B.C. Because of the conditions prevalent at altitudes of 2000 meters such as permafrost, perfectly preserved mummies can be found in graves -- one body is so well preserved that complex drawings are visible on its skin, which is the oldest example of a tattoo in the world. Additionally, each of the three-meter burial mounds preserved vehicles, patterns, and textiles, including the world’s oldest carpet. Most of these discoveries are exhibited at the State Hermitage in St. Petersburg. The Pazyryk Burials also has its own princess -- in 1993 the mummy “Princess Ukoka,” as she was christened to the local people, was found. During excavation of the third mound, a burial site from the Iron Age was discovered, under which lies another more ancient site. During the excavation, archaeologists found that the trough in which the body was placed in and buried was filled with ice. That is why the female mummy was so well preserved. The lower burial was found to be bricked with a layer of ice. A camera discovered six saddled horses with harnesses in the lower burial, and the ancient trough was made from larch wood and boarded shut with bronze nails. Close to the Pazyryk Burials is the Katu-Yaryk pass (in Altai: dangerous place) -- the pass was build with record speed: only three bulldozers were used over three summers. The slope of the mountainside of Katu-Yaryk reaches 70 degrees. Traveling through the pass allows one to reach the southern region of Lake Teletskoye, a UNESCO World Heritage Site comprised of the Golden Mountains of Altai. Many rivers empty into Lake Teletskoye -- a miniature Lake Baikal -- but only one river flows out of the lake, Lake Biya. Even in the summer, the water temperature does not rise higher than ten degrees. Holding nearly forty cubic kilometers of practically distilled water, Lake Teletskoye is one of the fifteen deepest lakes on the planet (its depth reaches 325 meters). The lake has not yet been disturbed by tourists, and Teletskoye’s main contingent includes tourist-fishermen. The lake is not too large and can be circled in one day. Its water is clear and the air is clean. Sport hunting and fishing are permitted, but not in the reserves. Almost all of the eastern part of the Altai Republic is occupied by the Altai reserve, one of the largest in Russia. The territory contains 1290 species of plants, 73 species of mammals, 300 species of birds and 1190 glacial lakes.